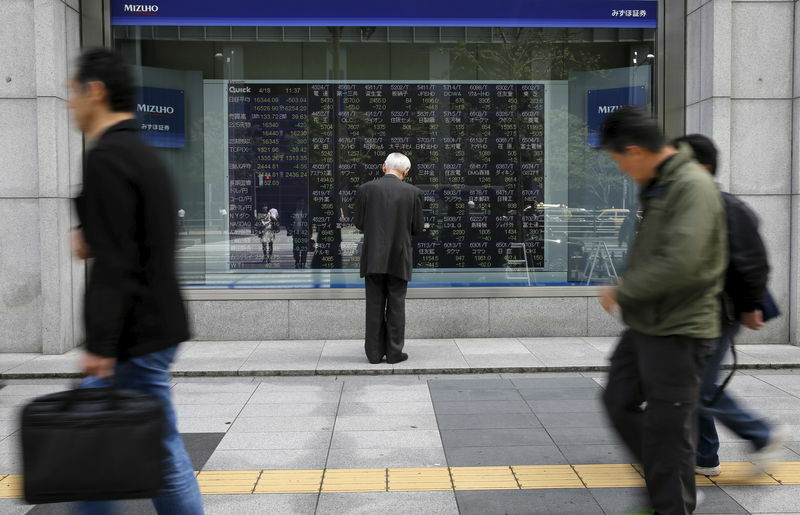 SYDNEY (Reuters) – Asian shares sped ahead on Monday as a dovish turn by the Federal Reserve and startlingly strong U.S. jobs data soothed some of the market’s worst fears about the global outlook. Chinese officials also meet their U.S. counterparts for trade negotiations starting later Monday, the first face-to-face talks of the year. U.S. President Donald Trump said on Sunday that the talks were going very well and that weakness in the Chinese economy gave Beijing a reason to work toward a deal. Shanghai blue chips () rose 0.4 percent, having already climbed over 2 percent on Friday. MSCI’s broadest index of Asia-Pacific shares outside Japan () put on 1.3 percent. Japan’s Nikkei () shot up 2.8 percent, while South Korea () added 1.2 percent. E-Mini futures for the S&P 500 () climbed another 0.4 percent. Risk appetite got a huge boost on Friday when the U.S. payrolls report showed 312,000 net new jobs were created in December, while wages rose at a brisk annual pace of 3.2 percent. Yet, Fed fund futures still implied a rate of 2.33 percent by December <0#FF:>, compared with the current effective rate of 2.40 percent. The combination of a strong jobs report and a dovish Fed helped the Dow () end Friday with gains of 3.29 percent, while the S&P 500 () jumped 3.43 percent and the Nasdaq () 4.26 percent. Analysts at Bank of America Merrill Lynch (NYSE:) noted global equity markets had lost $19.9 trillion since January last year, and a record $84 billion had flowed out of stocks in just the past six weeks. With 2,055 of 2,767 U.S. and global companies in a bear market, it might be time to buy. BofAML saw upside in Chinese and German stocks; U.S. small cap stocks; semi-government debt; energy stocks; U.S. dollar and euro high-yielding bonds and emerging market currencies. The latter had already received a boost from news Sino-U.S. trade talks were back on, as well as a natural bounce from the wild “flash crash” that rocked markets last week. The effect was apparent in the Australian dollar, which is often used as a liquid proxy for emerging markets and China risk. The was up at $0.7137 on Monday, having briefly dived as deep as $0.6715 last Thursday. The U.S. dollar softened broadly with the euro edging up to $1.1428 () and the () easing 0.2 percent to 95.971. The currency could not even hold early gains on the yen, lapsing back to 108.05 . Gold benefited from the diminished risk of U.S. rate hikes and held at $1,288.81 , just off a six-month top. Oil prices firmed after Brent bounced about 9.3 percent last week, while WTI rose 5.8 percent.